Copper oxide (CuO) is an attractive burn rate modifier for composite solid propellant based on ammonium perchlorate (AP). However, the mechanism of catalytic decomposition of AP in the presence of CuO is still uncertain. Amount of gaseous products at various decomposition temperatures of AP in the presence and absence of CuO is lacking. 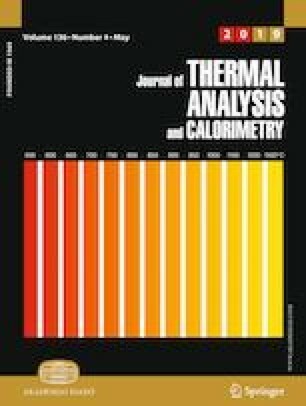 Herein, a systematic study using thermogravimetry-mass spectroscopy (TG-MS) was carried out to evaluate the effect of CuO on AP decomposition mechanism. A novel hydrothermal method was reported for the preparation of nanosized copper oxide. The conversion of precursor Cu(NO3)2·3H2O to intermediate Cu2(NO3)(OH)3 was accomplished by in situ carbonization of small quantity of cotton fiber in the hydrothermal reaction chamber. pH of the reaction medium was controlled by utilizing the nitric acid in the reaction medium by in situ carbonization of cotton. This synthetic method aimed to minimize the shape-controlling agents and strong alkali for controlling the pH of the reaction medium for the preparation of catalyst grade CuO. Evolved gas analysis of AP decomposition products by TG-MS showed increased oxygen, chlorine and nitrogen evolution and decreased ammonia evolution in the presence of CuO, compared with that of AP without catalyst. This confirmed the enhanced interaction of ammonia and perchloric acid; the initial decomposition products of AP; and their further reaction in the presence of CuO. The change in composition of volatile products indicates change in mechanism of AP decomposition from proton transfer to electron transfer in the presence of CuO. The online version of this article ( https://doi.org/10.1007/s10973-019-08209-5) contains supplementary material, which is available to authorized users. Authors acknowledge Director, VSSC, for the fund.